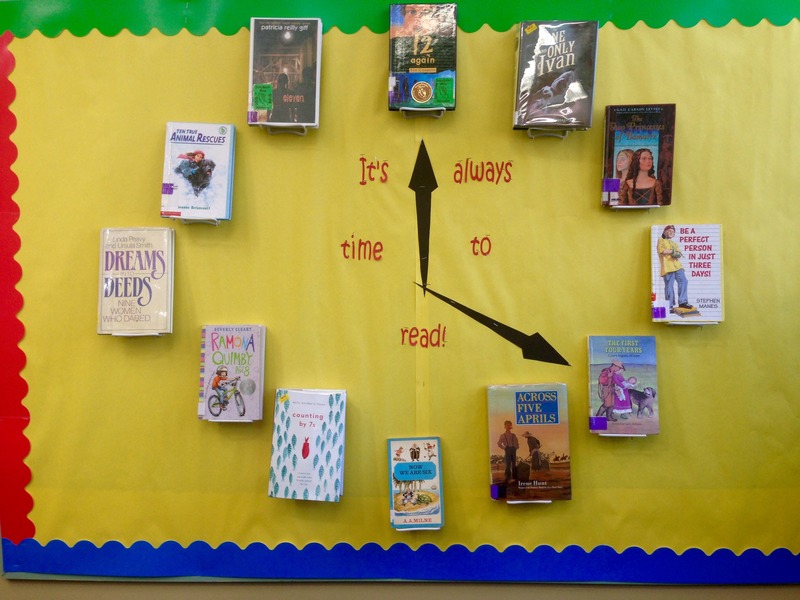 How do you quickly check out books to students, and avoid having a long line of noisy, wiggly students waiting? 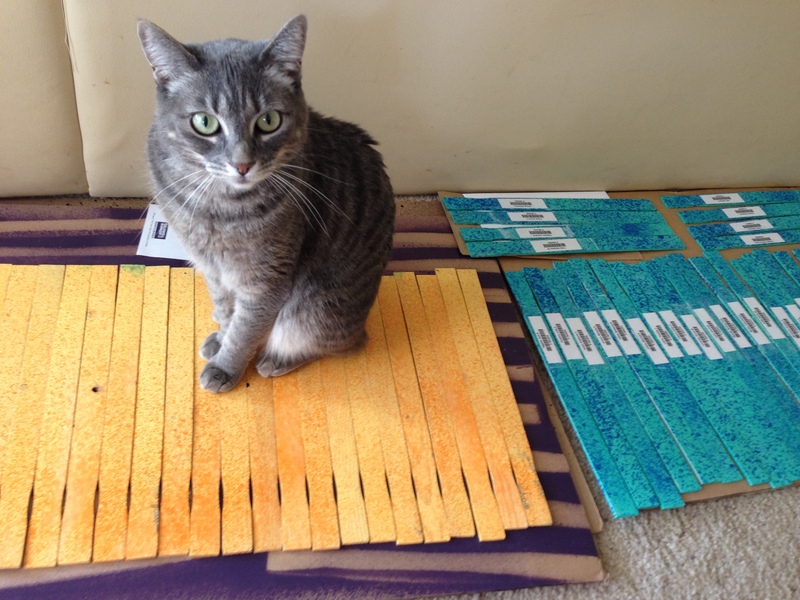 How do you make them use shelf markers when taking books off the shelves? Here’s an option that, in my opinion, is the most efficient, least expensive, and — full disclosure — most labor intensive start-up method. 1) When students say their name, type it in Destiny. 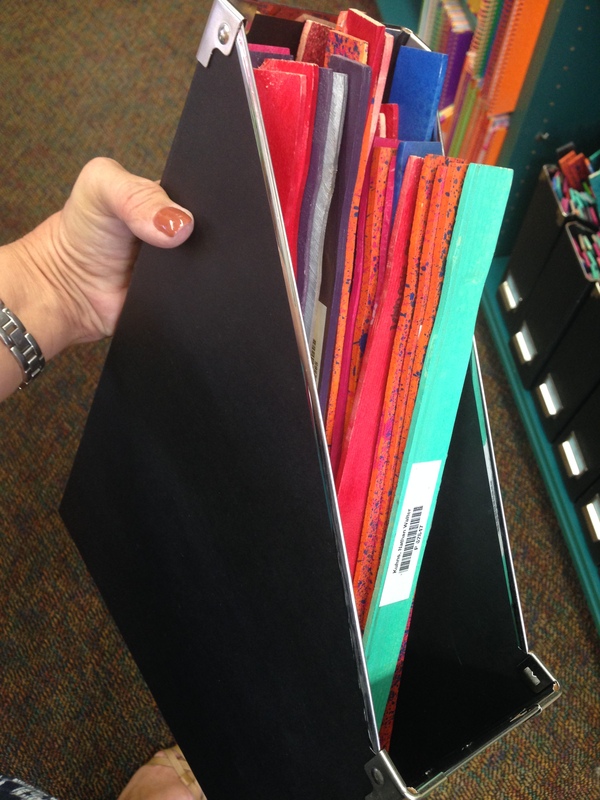 2) Print bar codes, by classroom, and keep in a 3-ring binder in page protectors. When students say their name, scan their bar code from the sheet. 4) Combine the name/bar code label with the shelf-marker! 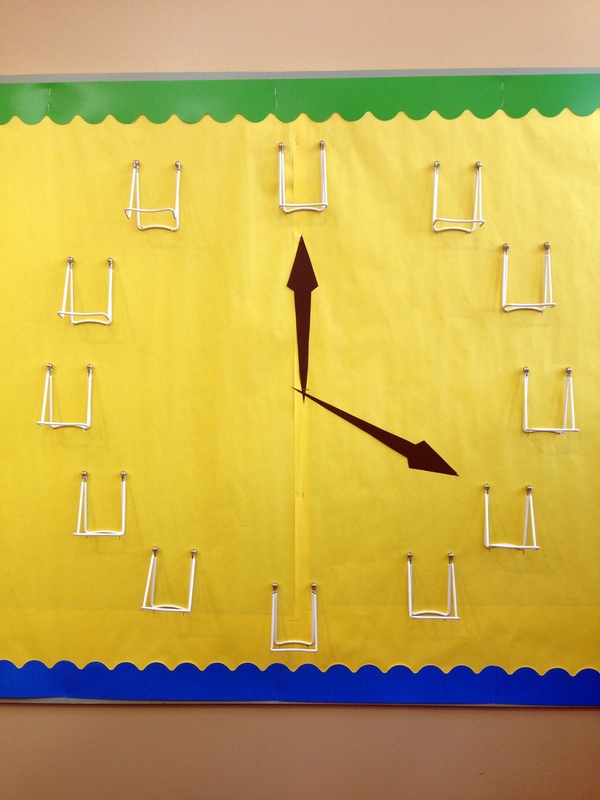 1) It forces students to use shelf-markers. No shelf-marker, no check-out. Books go back where they belong. 2) It solves the problem of not being able to hear the student say their name, or not entering it in Destiny the unique way their parents decided to spell it (Rylie, Rilee, Riley, Rylee). 3) Students can scan their shelf marker and books — they love this — under my supervision, and I don’t have to handle every book that gets checked out. I found the inspiration to do this here. I approached my favorite local paint store, Vista Paint, and asked for a donation of paint stir sticks. I went back several times, because the sales person said they could give me about 50 at a time. I have 750 students, so this looked like it was going to take some time. After 3 visits, they just handed me a box of 1,000! Thank you, Vista Paint! 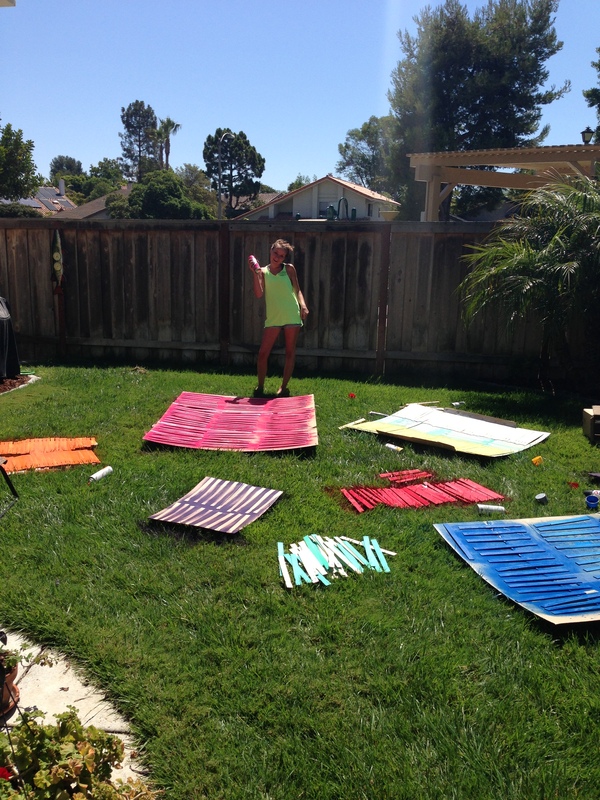 We started with solid colors, but when we got down to the bottoms of the cans, we started splatter painting. My original intent was to make one entire class the same color(s), but later discovered that Destiny had not been updated yet with the current year of classes when I printed the labels, so I had to re-sort all of them, and they were no longer color-coded by class. (Let that be a lesson to you.) 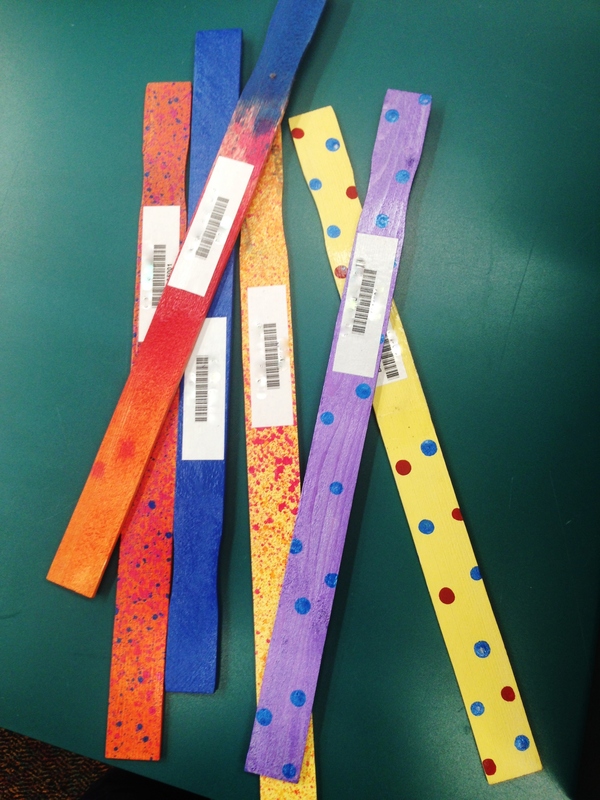 As it turned out, having uniquely painted stir sticks made it easier for students to quickly find theirs on the table when they enter the library. Her cat helped by supervising. I had a cupboard of miscellaneous acrylic paint, leftover from various craft projects, and I used these up as well. I painted spots, dots, stripes, splatter, and every other combination I could think of. I purchased magazine holders from Ikea, and keep them stored by class. I set them out on a table before a class comes in, and I put the empty container at the circulation desk. 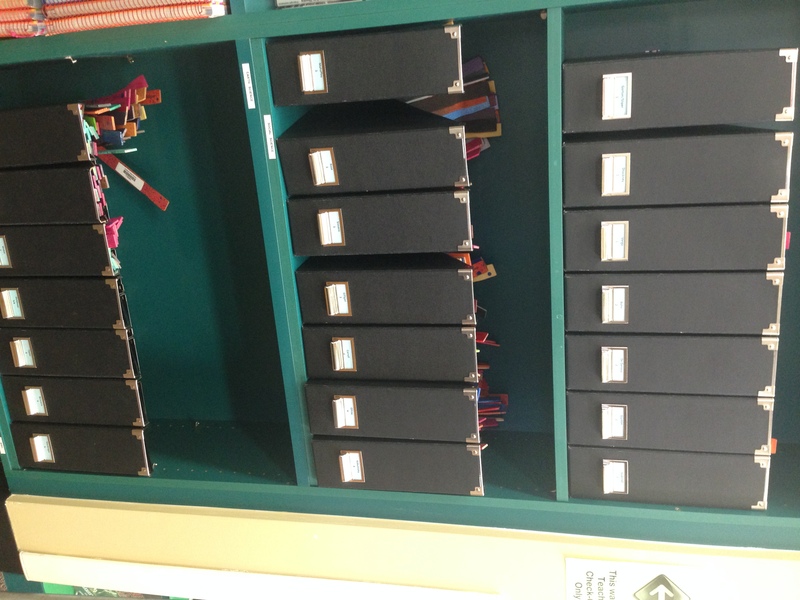 After students use their shelf marker to check-out, they put it back in the container. Additional labor I didn’t anticipate: The paint stir sticks are two-sided, and needed two coats of paint, in addition to a primer layer. The labels had to be cut down to fit on the sticks. The label adhesive didn’t stick to the wood, nor would clear tape hold them on, so I used two coats of Mod Podge to adhere them. It was a major time investment, but I was too far gone to stop. If you are ambitious enough to try this, I recommend not painting them like I did. I did not want students to decorate their own using markers, because I planned to reuse them for their entire elementary school career, and the drawings a kindergartener puts on a shelf marker are not ones they will appreciate having on their shelf markers as a 6th grader. Collaborating with an art teacher to do a directed painting project using the stir sticks, and allowing them to paint their own in a separate area would be one possible solution. This was a huge, summer-long undertaking, and had I known the extent of time involved, I’m not sure I would have attempted it. Having done it, however, is AWESOME! I never, ever have to say, “Use a shelf marker!” to students, they never get left in the shelves for me to collect later, and I don’t have to stress about remembering all the students names. That’s worth a lot to me. I’d love to hear how you handle check out and shelf marker use in the comments. Here are more helpful resources for using shelf markers.